This document is not intended as a Technical How To, but rather a document to inspire. I am not a professional spray painter, so please don't take my word as law ! The information presented herin is only a guide. After looking at many EF and some EL Falcons, I have noticed a rather sad phenomenon regarding poor paint treatment on the plastic parts, that are used to trim the glass. 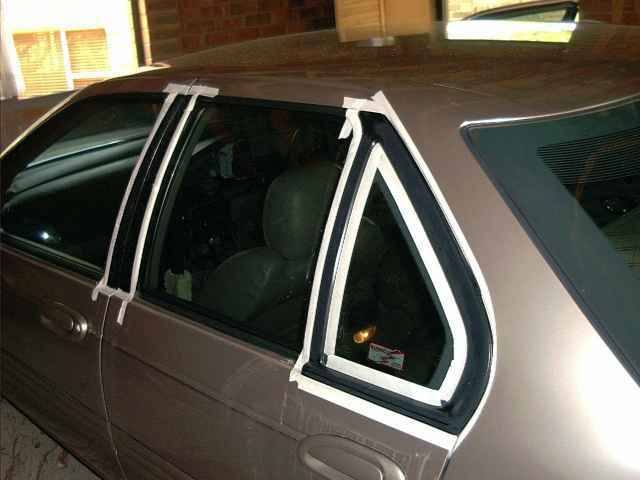 In particular, the quarter window on the back doors. The paint seems to chip, and peel very easily, especially if the car is not garaged. What I have done with my EF is re-sprayed these trimings, in Ford AU - "Pearl Black"
I choose the Ford Black Pearl because its it gives a black Graphite look when dry, is easy to work with, and does not end up being too glossy. 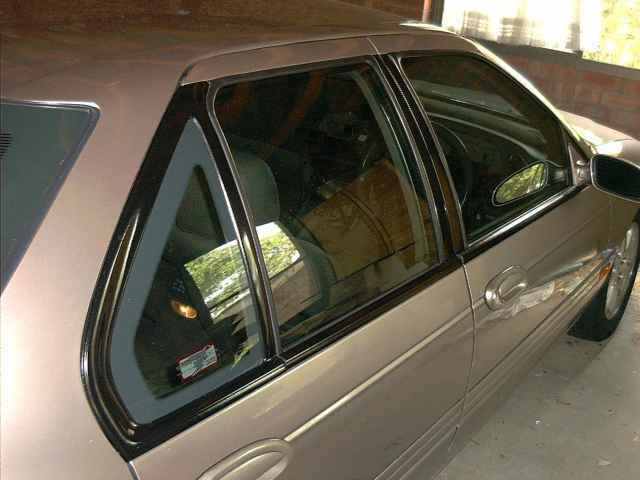 As for the Clear coat paint, I beleive in using a clear coat, because it helps protect the paint from fading when the car is left in the sun, and also makes the paint more resiliant to scratches. Finally, This took me about 1 week to complete. The following is a run down of the time spent for each stage. 1 Day to prepare all the plastic parts for primer application. 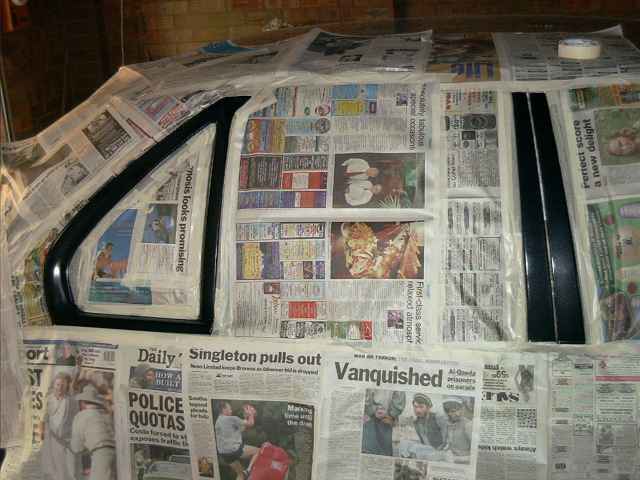 1/2 Day to mask all the area's around the car, for primer / paint application. 1/2 Day for primer application. (Most time spent waiting for primer to dry). 1/2 Day for Paint Application. (Again, most time spent waiting for coates to dry. 1/2 Day for Clear Coat Application. 1/2 Day for removing masking tape. 3 Days for further drying. (The car can be used during this period, but you must be carefull to not get the paint wet, or to let people rub the paint work. Anyway, the following is a proceedure on how I acheived this, and what the end result looked like. Firstly, the areas surrounding the plastic in which I wanted to paint, were masked off. This was due to the fact that I needed to prepare the surfaces for plastic primer application, and masking these area's would protect the surrounding parts from the sandpaper. Once the areas required were masked off, and parts were removed, I prepared the surface using 1200 grade sandpaper. This consisted of removing any previously applied paint, and ensuring that the surface was smooth. Once the surface was sanded back it was then washed with soapy water, to remove any sand grit, dust, and paint flecks that may have remained. 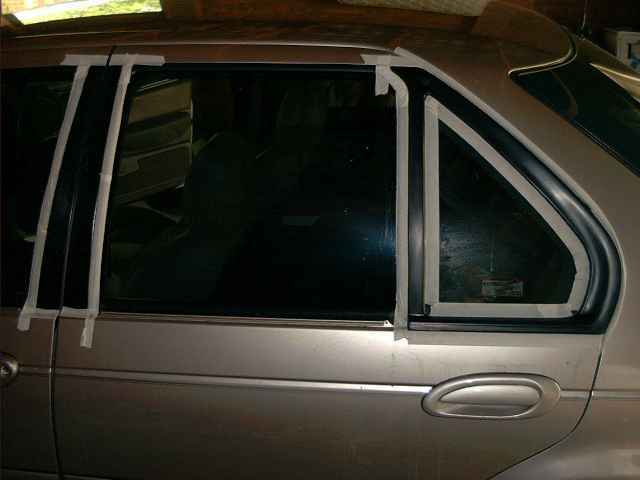 When the water had dried, I began to mask off all the areas around the car, that I didnt want painted. Because the garage that I was using had some wind blowing around, I decided to properly mask off most of the vehicle, so as I was sure that nothing I didn't want painted, would not get painted. Once I had finished masking the area, I began to apply plastic primer thinly to the surface to be painted. A light coat was applied, and I waited approximately 10 minutes before each coat. Until the plastic took on an even, shiny appearance. If the primer began running, I would wait for that coat to become touch dry, and sand the offending area back, untill the surface again was smooth, with no visable signs of the paint run. 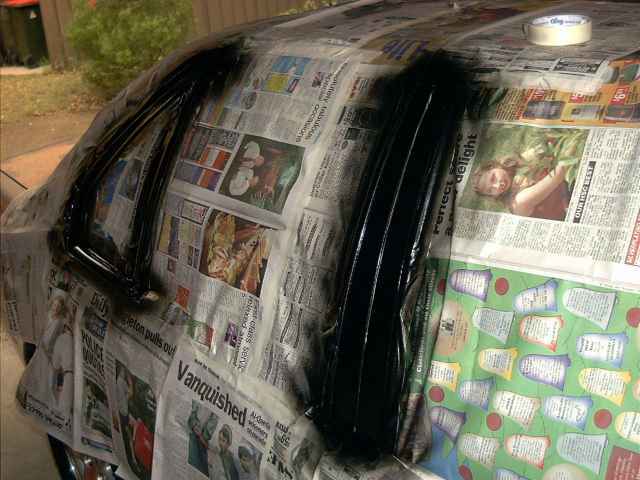 Once the primer was applied, I waited for about 1 hour, for the final coat to become touch dry. 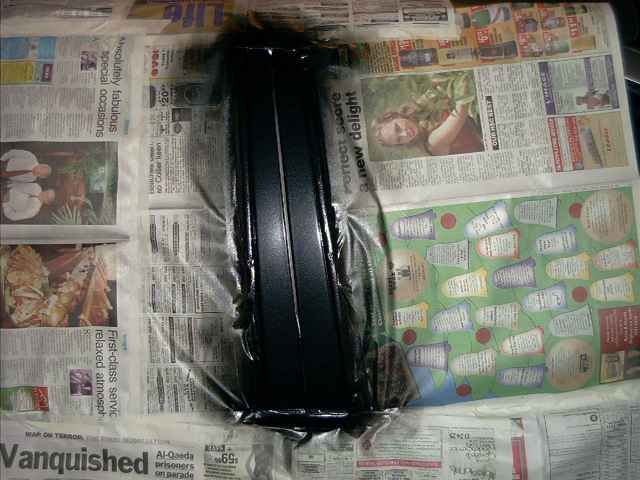 Once this was the case, I then began applying the colour coat, (Ford Black Pearl). 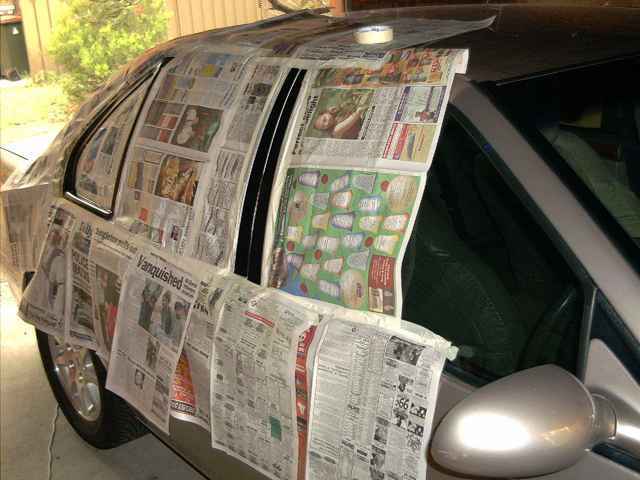 I used the same method as per applying the primer coat. Finally, once the colour coat looked evenly matched, smooth, and properly applied, I left the paint over night to dry. The following morning, I began to apply the clear coat. Because the clear coat paint was not the premium stuff, I applied thicker coats, and used a hairdryer to help dry each coat after application. This was due to the fact that I didnt want Dust to rest, and get stuck on the outer coat. I also found that the If the CLear coat was sprayed too thickly, it would appear a milky white colour. Blasting this with the Hair dryer, on high heat setting for about 1 minute, quickly evapourated any moisture in the coat, and cleared up the milky stains. I also found that If I didnt apply heat to these stains, they tended to become permenant. I found that although when you apply the clear coat, the paint appears to be very glossy, the gloss actually dies off, and it loses its "wet look"
After the 2 days, I then removed all the masking around the car, and fitted the other painted plastic bits. Finally, I waited about a week, and gave the car a good wash. Document written by: Matti on 17 2002>, Copyright © 2005 Matti, all rights reserved.